Is the Apparent Selfishness of Mitt Romney Evidence of a Larger Problem? 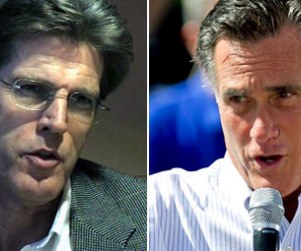 Mitt Romney is shaped primarily by his upbringing in the Mormon Church. It is relevant in this case because it is the vehicle by which he justifies his reluctance to release his tax returns. Those returns would demonstrate the pittance he has paid to the American Government due to his creative accountants finding every single loophole domestically and offshore. It also has justified his acquisition of wealth at all costs, especially by the devastation of so many lives and jobs which Bain Capital has decimated. My questions grow as I consider these two aspects of the faith: (1) The LDS church is one of the wealthiest religions in America while, (2) Mormon-dominated Utah is consistently first in personal bankruptcies. The Church gets rich–as members get poor. I looked to Park Romney for guidance. Ostensibly, Mormonism is a Christian religion and as such, subscribes to Christian values of selflessness, charity, and sacrifice in the service of one’s fellow man. Many, however, have shared observations about the apparent materialism so often seen as a part of Mormonism. Questions about the Mormon culture and what underlies the Mormon materialism understandably arise. Mitt Romney’s massive accumulations through the questionable business practices of Bain Capital are at the forefront of social discourse at this moment. No less relevant are the business practices of a Mormon Elder or High Priest, who, employed as the business manager at a veterinary clinic, requires that his staff overstate to clients the needs of their animals in an effort to emotionally manipulate them into paying for procedures that are not reasonably required for the satisfactory life state of the pet, but rather enrich the veterinary practice by exploiting the good will and loving concern of the pet’s owners, or the morality of the Mormon attorney, who exploits the faith and hopes of his client by subtly misrepresenting the likelihood of successful litigation with just enough vagueness and ambiguity to get the retainer amidst plausible deniability that he ever made any enforceable representations. Al Sadir explains that three key elements of awareness emerge as the human psyche is born into existence in this human realm. These elements of awareness cannot be explained by the experiences of this human sojourn, but are, rather, key elements of perception by which we make sense of our sojourn and without which we would have no hope of intellectual development. These elements of awareness are causality, non-contradiction and harmony. Nothing that we observe in this existence would be understandable on any meaningful level, explains Al Sadir, if not for our primordial awareness that the realities of the universe cannot be, and not be, simultaneously; have direct and indirect causal relationships; and exist within the constraints of inescapable cosmic balance. Without these fundamental and primordial elements of awareness, we may observe that rain falls from the sky and we may observe that the ground, at times, appears wet, but we cannot make the connection that the wetness of the ground is caused by the falling rain without an inherent primordial awareness of the principle of the meaningfulness of causal connections between the realities that we observe. We may observe that a rock falls to the earth when dropped and that smoke rises to the heavens, but we cannot extrapolate the ramifications of these consistently observable patterns without a primordial, pre-conscious, appreciation for the fact that the observable patterns themselves are meaningful as patterns and that the realities of the universe exist in harmoniously self reconciling realms manifested by the meaningfulness of the observable patterns. We may observe that a wild carnivorous beast will devour its prey to sustain its life, but this observable fact will be of no meaningful value in sustaining our lives without understanding the significance of the consistency of observable patterns. To survive, we must grasp the inherent dangers associated with expectations that rely on arbitrary explanations of observable patterns that defy the inherent harmonious balance of the universe with unwarranted contradictions of the underlying causal realities. In the end of the day, not only the survival, but actually the morality and very sanity of man is dependent on the existence of and respect for these inherently fundamental elements of primordial awareness without which the process of independent intellectual development based on reasoning cannot exist. These elements of primordial awareness are inherently part of a healthy psyche before any observations are made because they are inescapable realities of the cosmos that make up the very existence that is us. It is by these elements of primordial awareness that we are capable of understanding what we observe. It is only by the application of these primordial elements of awareness that we are capable of the development of a useful base of knowledge by which we make sense of the universe within our purview and apply ourselves to successful management of the opportunities that the universe presents without the self destruction that would be otherwise assured. What becomes of man, who is incapable of reasoning on his own with the inherent tools of reasoning that the cosmos has endowed us with? The Mormon philosophical experiment demonstrates with the entirely predictable consistency of these inescapable cosmic principles of reality, that a man, once stripped of his respect and appreciation for the essential applicability of these primordial principles, as governing anchors by which he processes not only his awareness of the universe within his purview but, as well, his self awareness, will be rendered an empty exploitable human shell of a being, capable only of conforming to the arbitrary expectations of his adopted social order without the capacity for truly independent consideration of his choices in any way that transcends the childish process of checking with his adopted external moral arbitrators for their validation and approval of the acceptability of his choices and behavior. Here is a dangerous man, fully capable of conforming to the ostensible behavior that perpetuates his accolades, but incapable of independent moral assessment of his choices, by reason of having long since abdicated his individual responsibility to apply the eternal cosmic principles of non-contradiction, causality, and harmony in his measurement and assessment of the realities of the universe that now include his own choices. He is a moral and intellectual dependant whose choices will not exceed the bounds of the comfort zone of his dependant conformity. He is incapable of the independence of thought and moral processing that is unfettered by the warped external demands of his adopted moral and spiritual authority figures. Mormonism is an intensely corrupt philosophical system whose social order and objectives are precisely the exploitation of human conformists who have been stripped of their epistemological independence as described above. Clear, unmistakable, and glaring evidence of this is found in the contrived Mormon scripture, The Book of Mormon, foisted upon the naïve among us, as the word of God, while demanding the abdication of reason, itself, in favor of a childish, feeling based, emotional satisfaction that one’s conformity to the “commandments of God”, as interpreted by an arbitrarily self appointed priesthood, is the sole basis for the establishment of truth as truth, and morality as morality. The Book of Mormon aggressively instills in its devotees, with example after example, that prosperity is the hallmark of worthiness before God, and that economic failure or humility is evidence of the unworthiness of those who must be humbled by God by not being prospered due to their unwillingness to conform to the “commandments” as arbitrarily dictated and interpreted by God’s priesthood. These commandments may be to murder on one day, as in the case of the Book of Mormon prophet, Nephi’s, justification for taking the life of Laban in order to fulfill the commandments of God to acquire a historical record of his family; or to lie on another day, as in the case of the several “eye witnesses” who were to bear testimony to having seen the golden plates from which the Book of Mormon was supposedly translated, notwithstanding the fact that Mormon historical records clearly indicate that it was conjured by Joseph Smith through the ridiculous and previously exposed process of glaring at a peep stone in a hat and dictating the text to accomplices to the deception referred to as scribes. Ultimately, prosperity for one’s self and for the Church are the main “spiritual” pursuits of “God’s Kingdom” of devoted Mormon followers, the most worthy and devoted of which having partaken of solemn temple covenants of “consecration” in which they are placed under solemn oath to devote all of their life, time, and talents to the building up of the Kingdom of God (The Mormon Church). This, while abdicating the moral requirement of scrutinizing the reasonableness and moral and intellectual consistency of their thought processes in favor of adopting the first principle and commandment of the “Gospel” as taught in Mormon temples, which is obedience, ostensibly to God, but, as a practical matter, to God as interpreted by his exclusive agency on earth, the Mormon priesthood. With the convenience of a “spiritual” exemption from the constraints of the moral and intellectual demands of the most fundamental cosmic elements of relevant awareness in assessing one’s own contradictions and the contradictions of one’s own borrowed morality, Mormonism places cultural demands of prosperity on its devotees and reinforces those demands with a “spiritually competitive” spirit of ostensible worthiness demonstrated by material prosperity and notable contributions to the building up of “Zion” that are an economic stretch for the average member, at best. Intense social pressure for success and successful contributions, both in devoted time, talents, and money, is unleashed while strict scrutiny of moral appropriateness is undermined and reduced to a few simple perfunctory temple worthiness questions, which, if answered correctly, satisfy the arbitrary priesthood as to the worthiness of the candidate not only for temple attendance, but for ultimate exaltation in the Kingdom of God. I recall, some years ago, a prominent Presbyterian minister, also a dear friend, approached me and shared his dismay as the then, Mormon Mayor, had shared with him proudly, at a Christmas party, as he declined a social drink that was offered, exclaiming that alcohol had never touched his lips. He was proud of being a worthy temple attending Mormon who adhered to the “word of wisdom” which is the Mormon scriptural edict on the subject of alcoholic beverages. We were both aware that the same Mormon Mayor was being investigated for several counts of corruption. He was ultimately convicted on several felony counts of self dealing arising from his own personal pursuit of prosperity at the expense of his oath of office and the interests of his constituents and in the absence of a healthy moral compass independent of the approval of local priesthood leaders. His Mormon priesthood leaders were found criticizing, not the Mayor, but his critics for inappropriate gossip. A Mormon elder had represented the Mayor as his attorney and publically declared his innocence. He was associated with condemnations of the Mayor’s critics as engaging in politically motivated misrepresentations. He was advanced to the office of High Priest by his local Mormon leaders and called to be a Bishop. His slander of legitimate and honorable critics of the Mayor was, apparently, overlooked as a worthiness issue relevant to his advancement in the priesthood. Today the world finds before it the ultimate manifestation of Mormon culture in my cousin, Mitt Romney, who seems inexplicably blind to the obvious credibility gap his public contradictions and the moral example of his chosen career at Bain Capital present us with. In an amusing commentary by Rachel Maddow, the MSNBC commentator, she repeatedly mused at the various obvious contradictions and inaccuracies that Mitt has been associated with, by posing the question, “What is that?”, in reference to his incapacity to acknowledge his mistakes and misrepresentations and inconsistencies. What is that, you ask, Rachel? That, my friend, is Mormon epistemology. Get used to it. There is a considerable risk that it will become the guiding philosophical principle by which the prospect of war and peace are managed on the planet. Very interesting of you to bring up Baqir al Sadir, he also had a sister who was named Binta al Huda and she did some very interesting work along with her brother. Bint al Huda was also sadly murdered. The most troubling aspect of this is that an extreme guilt exists deep in their psychic being that may prevent them from seemingly harmless undertakings like the consumption of caffeinated beverages, or alcohol yet most troubling corruptions are easily overlooked or viewed in an entirely different light than what average everyday midstream Americans would observe. That said one must question what might possibly go on behind closed doors, and who would benefit, or lose, as a result. This notion should be enough to question seriously, ones capability to govern at any level. On the eve of Mitt’s run for the GOP nomination I found myself coming to the aid, as requested, of a friend that I’d met in San Francisco during the 1970’s. He lived in St. George and had been a successful sports manager to Seve Ballestreos, the golfer. During the five months I spent with he and his family I got re-introduced to Mormon greed and it’s desperate folly to gain wealth and power. As Mitt’s campaign came to reveal his lack of honesty and avarice I had to come full circle to the conclusion that Mormon’s seek nothing less than the re-ordering of the universe to their will and treatment. Romney is as disingenuous and avaricious as his cult.